After spending the weekend in pain, I finally got in to see the endodontist this morning. He started by telling me he was going to numb it and then repack the tooth. I started by telling him no. I didn't want to do anything else with the tooth. Surprisingly he didn't argue and said that extraction was certainly an option. Said he would refund half the money I had paid and made an appointment with the oral surgeon next door for 3:15 this afternoon. We went back home and worked on some more "stuff." I was back at the oral surgeon's at 3:00, got the paperwork filled out and told him how scared I was. He was very nice, told me exactly what would happen and amazingly I sat through it quite well. I don't want to do it everyday, but it wasn't bad. It hurts now, but I am hoping once it is healed the pain I had will be gone and my mouth will be back to normal. Thanks to all of you for your well wishes and concerns. I am so glad I got it done today. I couldn't believe they got me in today to do it, but looks like we are on schedule to leave Sunday as originally planned. We painted the kitchen and laundry room Monday. Once we leave next week, the floor guy is coming to lay the laminate floor. That should be such a big difference and should really spruce the house up. We are going to do more work on it, but we just try to do a little bit each time we are here. When we leave Sunday we are going to Dale Hollow Lake to take the boat and jetski. We are storing them at Sunset Dock so hopefully we will be able to use them when we make a trip through periodically. From there we go to the family reunion in Mississippi, then on to Red Bay for coach work. 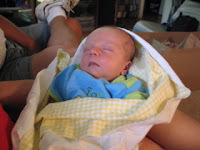 Then we will head to Charlottesville to see grandson Ronan. 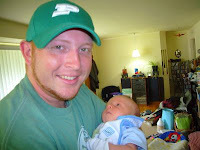 This weekend, our son, Brandon, flew from his home in Florida to Charlottesville, Virginia, to see his new nephew. He and Jocelyn had not seen each other for a couple years, I think. They are both busy with their lives and live about 1100 miles apart, so they don't get to see each other too much. We are going to spend this winter in Florida so perhaps we will all get to see each other and actually spend a little time together. 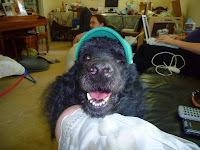 Brandon had also not ever met Jericho, the standard rescue poodle. He is a very nice dog and his first home was actually around children, so he is very good with kids. He is doing well with the new addition to the family and still gets included on family outings. Jocelyn and Tom took Brandon to see a few sites around Charlottesville, which is close to the Shenandoah mountains and valley. They are close to both the Blue Ridge Parkway and Skyline Drive so they don't have to go far for scenic views. I am here nursing a bad tooth. Anyone with any experience with root canals? I had a broken tooth--one that didn't hurt--but the dentist said it required a root canal and crown. So last year in May I had a root canal and crown done. Then it hurt. . . not a lot, but it was annoying. The endodontist last week retreated the root canal, which means he re-did it. Now I am having excruciating pain. He did it on Wednesday and Friday as I was eating a soft piece of bread, something happened and it felt like someone was driving a nail through my tooth with a hammer. Now I cannot eat. Chewing on the other side causes pain on the bad tooth. Course, it happened Friday night at 6 and the endodontist closed for the holiday weekend at 5. I still left a message, but no one has called back. If I take a Tylenol3, then don't eat or move my mouth, I can get buy. I can press up under my chin and feel pain. I can TOUCH the tooth on any surface and I have pain. Now, mind you, the dentist said he didn't see ANYTHING that would be causing my discomfort as he re-did the root canal. I am leaning toward having it pulled this week if I can get in somewhere as we are scheduled to leave Sunday for a month. The problem is that it is my back molar and the one in front of it may not be real strong. Dentists today don't want you to pull anything, but I am not going to put more money toward more pain. And if the endodontist couldn't find anything wrong with it before, what is he going to do to "fix" that which he cannot find? I have not had any luck finding emergency dentists in the Goshen/Elkhart area, so I guess I am waiting till tomorrow. Wish me luck. We made plans to join other friends at the Elkhart Campground at least until the mosquitos started biting. We arrived a little late; they almost started the party without us. We gathered in front of the Teton of Smokey and Pam and joined them, Nick and Terry Russell (Gypsy Journal). Nick modeled his new dew rag for us. Also at the gathering were Rocky and Bernie Frees. Rocky does all kinds of RV Service and Bernie is a masseuse and gave me a wonderful massage yesterday afternoon. I had the misfortune of having a root canal done in the morning and I was pretty stressed out. We sampled Miss Terry’s rice crispy treats which were very good. Bailey, Smokey and Pam’s black Lab, did the dishes. She likes paper plates, cups, etc., and picked up most of them and plopped down on the ground amid her trophies. Buster, the Cocker, kept us apprised of when other dogs in the campground were around. Pam was complaining about some chest pains she was having. Not sure what was causing them. Okay, okay. Pam is fine. Buster was sitting on her chest and if you look at the picture, you can see why she was complaining. Hah. Pam is NOT really having chest pains. She just had Buster sitting on her chest. We talked about what we were all going to be doing in the next couple days. Some were going to FMCA in Berrien Springs, Michigan, some to a show in Valpo, some to Ohio, and we are at our “workcamping assignment” for the summer. That is what we have decided to call our apartment maintenance that we do for a few days every summer. We are putting in a new floor in one, new garage doors and stoop carpeting in 2, and hopefully will get the windows painted on all the apartments this summer. We won’t do much of it, but we have stuff to pick out and people to hire. We have finally quit playing airbed roulette. We like sleeping on air and took the plunge to what we thought was the “ultimate” in air bed sleeping. We purchased a Select Comfort Sleep Number bed. Worst sleep we have ever had. It is boxed back up and awaiting the UPS man to send it on its way. We went back to LinenNThings and exchanged for our third AeroBed. We really like the AeroBed but have had difficulty with them leaking. But we still like them a whole lot better than the Sleep Number bed. On a lighter note, Terry bought Sirius Radio for the Sport Trac. We have it in the motorhome and really like it, so they had a pretty good deal going and he got it. I told him he has so many extra gadgets in the car now that the battery will probably run down going down the road. Hah. Okay, okay, okay. . . I don’t like being back in Indiana because it means work, work, work. We have an empty apartment we need to get cleaned and ready. The cleaning won’t be bad as the former tenant left it in good shape. We also plan on doing a lot of redecorating on the main house this summer starting with a new floor in the kitchen and new appliances . . . new stove and new dishwasher. Want to paint the entire inside and get rid of some really awful wallpaper the in-laws put up over 20 years ago. We arrived back here on Sunday, the week before Mother’s Day. We parked Phaeton Place in the side yard and drove down to Claypool to see my sister and her husband and Mom and Dad. Nita and Jim built a big new house in a woods and Mom and Dad have a new park model parked near the house in the woods. Mom and Dad moved in after returning home from Texas this year and they really have their place fixed up . It is really nice and a much nicer atmosphere than had developed where they last lived. And they are close to Nita and Jim should they ever need help. Mother’s Day we spent back down there and all of Nita’s kids and grandkids came along with the grandkids’ other grandparents. We had a pitch-in dinner and way too much food, but boy was it good! We got to meet "Delta," niece Kellie's newest rescue, a retired racing greyhound. We visited for a time afterwards, then headed back to the house and our dogs. Tuesday this week, we drove Phaeton Place down to Summit Lake State Park near where we used to live (Mooreland, Indiana). The park was at one time a county park and the state purchased it years ago. In all of its infinite wisdom, the state took a park that had a campground filled to capacity every week and weekend of the season and jacked up the prices to where there are fewer than 20 units in here at this point. Last year we were here numerous times and it was always the same. I don’t understand why they don’t lower the price and get people in here to fill it up. We are here because it is convenient to where we had to go and while more than we like to pay, we are doing less driving the truck while here. We had hair appointments in New Castle, then Terry’s doctor appointment. All is well there. Then we met our broker and today we had to go to Indy to see the cardiologist. Everything well there also. So we are free until the end of September when we head out again, this time hopefully AHEAD of the cold weather and snow. We took the dogs in today for Bailey’s yearly and the vet checked Neal over since his recent surgery. He said Bailey has a very strong heart and will probably live another 10 years. Those of you who know Bailey will be pleased at that! We also made a trip over to Modoc to get our boat out of storage. Don’t know where we are going to put it, but we will have to find someplace. We are headed back to northern Indiana tomorrow and will try to get started on the apartments before leaving the first week in June for Mississippi. We are going to the Pace-Stevens family reunion on June 9. After the reunion we are going to Red Bay for some service work on Phaeton Place. We are well but suffering greatly from “Ronan and Jericho withdrawal.” I think after Red Bay we are going to make a quick run to Charlottesville. Not sure after that, but we are going to work in a trip home to South Dakota sometime after that. And so we say Goodbye to Ronan. . . for now. We spent our last afternoon with Ronan yesterday. I babysat while Terry took Jocelyn shopping. It was raining and I certainly preferred keeping the baby inside. Babies are just so precious. They are so dependent on us for everything, but they give us back so much love. Probably don't think so when they give us poopy diapers and crying, but that is what being a baby is all about. Jocelyn and Tom are such great parents. 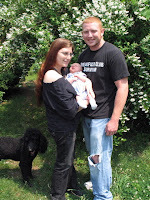 They have waited a long time to be called Mom and Dad, and they are enjoying having a baby in the household. Even Jericho, their standard Poodle, likes Ronan. He is getting plenty of attention too, and isn't jealous. He is a rescue and his first home was with children, so I am sure he is looking forward to the time when Ronan can actually play with him. We drove a long day today, but hey, you can't park a 40 foot motorhome in West Virginia. They don't have 40 level feet in that entire state. So we are just across the Ohio river in Gallipolis, Ohio. This is a very nice campground at the fairgrounds. It is almost empty and has full 50A hookups for $15. So if you ever find yourself in this area and need a place to stay, check it out. Tomorrow we have reservations at Camp Pull-Tab. It's expensive there, but the company is superb. I am leaving you with our last pictures of Ronan and us. Looking for Love in all the Right Places! You just can't love a baby too much, that's for sure. We have been visiting every day, trying not to make a nuisance of ourselves. Tom is back working and since he works at home, we don't want to distract him from that. Yesterday Jocelyn took Ronan to the doctor. We were outside and missed the phone call asking if we could take her and the baby. By the time we knew they were going, they were gone. Ronan has developed a bright red rash and Jocelyn took him to have it looked at. The doctor said it was the "new baby" rash that most newborns get and they just checked to make sure he didn't have a temperature, which he didn't. It doesn't seem to bother him so that is good. It is mainly on his arms, but the doctor said it will likely spread before it goes away. He is steadily gaining weight. 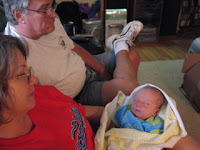 . . he had gained 8 ounces from Friday to Tuesday, so she was happy with that. 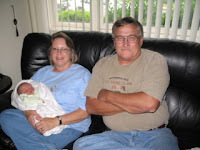 When they got back, we arrived and I got to babysit while Terry took Jocelyn out to run some errands. They were gone over an hour, so I got some quality time with Ronan. He is so cute. Still mainly sleeps, but has some periods of time after he eats, usually, where he just likes to look around. He has blue eyes and dark hair and usually only fusses when he needs changing or if he's hungry. I get to babysit again today. Jocelyn is anemic and she was not able to have any iron infusions while she was pregnant and she is going today for the first of two. I'm glad we can help her out with this as Tom is working and I wouldn't want her to have to take the baby with her. It can take anywhere from 1-3 hours. Terry is going to drop her off and go get her when she is done. Yesterday the contractors finished with the work at the house from the tree falling. The fence is fixed, the roof is done and beautiful, the new guttering is up, the cracked wallboard inside is patched, and the paint touch-up is finished. I thought they did a very nice job with everything. 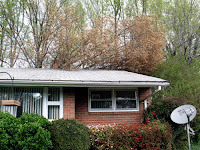 I know the kids would have preferred not having to do the roof in the middle of baby time, but it worked out well really; and if you are gonna' have a tree fall on your house, best let the insurance take care of it. They were fortunate that it didn't do more damage to the house, but enough to the roof that the insurance company replaced the entire thing. Here are before/after shots. The first one shows the tree laying across the back of the house. I still haven't had any luck finding any property around here. I see plenty for sale and several parcels we would be interested in, but I guess realtors don't want any motorhomes around. They are throwing around words like "ordinances" and "zoning." Hmmmm. I think they assume I am going to start some sort of trailer city. There are a lot of "hunting" cabins which consist of travel trailers sitting in woods. . . . not sure what the difference would be. I got up with the dogs this morning and let Terry sleep. He is upset that his satellite TV is pretty much gone now. When we arrived to the "wooded" campground, there were no leaves on the trees. Getting a signal was easy, but now that the trees are leafing out, his signal is gone and he cannot seem to get it back. Fortunately the Datastorm must be shooting through a couple branches up there as it is still working.